After his first arrival in Indonesia for “Spotify On Stage 2018”, boygroup rookie from JYP Entertainment, Stray Kids finally came back to Indonesia to meet STAY through their concert titled “Unveil tour I am…” in Jakarta. Their first concert in Indonesia was held in ICE BSD Hall 5 on January 26, 2019. So, STAY let’s check this out! The group with nine members including Bangchan, Lee Know, Woojin, Han, Changbin, Seungmin, Felix, Hyunjin and I.N started their concert with their pre-debut song “Hellevator”. 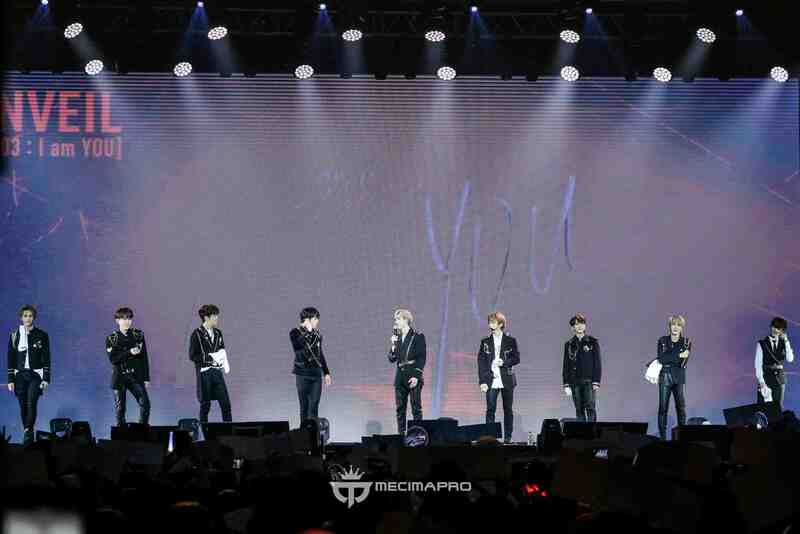 The nine members appeared very powerful on the stage wearing black all-out outfits. The STAYs who have been waiting for Stray Kids’ appearance for a long time immediately encouraged them. After the opening of the “Hellevator” song, Stray Kids returned to the stage by performing “Grrr”, “NOT!”, “Awaken” and continued with their debut song “District 9”. Their performance was very impressive for STAY. During the song “District 9”, Stay Indonesia did a very loud and compact fanchant. It’s time for ment, this is the most awaited moment for STAY Indonesia because they introduce themselves in Bahasa. Throughout this first ment, they also did the funny things and adorable action, especially their youngest member I.N. He was very expressive when his face was highlighted by the camera. The first Ment was finished, the nine boys then continued their appearance with “Mirror” and “WHO?” that was performed by Woojin, Han, and Felix. They don’t seem to run out of energy to show the best performances at this concert. After performing two songs, Stray Kids began to move from the main stage and walked along the stage to greet STAY who arrived at their concert. The boyband who debuted in 2017 then continued their appearance on the stage with “Insomnia” and “Voices”. STAY also sang along with Stray Kids. The strong energy from each of their appearances is no doubt. They make STAY to get goosebumps when they hear the high notes from Woojin on “Voices”. Finally a song that makes us all become STAY, a song from their second mini album in 2018 “My Pace”. Everyone in the venue was on fire. They doing fanchant throughout the song. Stray Kids’ very energetic appearance also triggers STAY to always encourage each of their performances. It’s the second ment time. The members stood at the main stage and returned to greet the STAY that arrived in their concert. During this time, they said that they were very happy to be able to return to Indonesia. They were also very impressed with STAY Indonesia, who was able to sing and doing fanchant together even though their language was different. The atmosphere turned emotional when Stray Kids performed “You” and “My Side”. After that, STAY was increasingly touched by the VCR that showed how Stray Kids was working very hard for their concerts and also their struggle to become Stray Kids themselves. STAY was touched and glazed at the VCR. “4419”, “Glow” and “School Life” became the next song. Stray Kids have changed their costumes into white jackets. They are very fun and very cheerful during “School Life” performances. Whereas in the “Glow” they become softer especially when STAY accompanying them singing along the song while turning on the lightstick together. What a beautiful moment. We arrived at the end of the concert. In their last ment, all the members thanked STAY Indonesia for coming to the concert, leader Bangchan also said that this was beyond their expectations. They also hope that STAY will always be with Stray Kids and support them. It doesn’t feel like two hours have passed, it’s time to split up. The last song to conclude this concert was “Awkward Silence”, “YaYaYa”, and “Grow Up”. They were very active when singing that three songs. They went around the stage and did a lot of fanservice. They have a lot of fun during this concert and STAY was very happy and hype up until the end of the concert. Thank you Mecima Pro for bringing 9 talented boys to meet STAY through their first concert “Unveil Tour I am..” in Jakarta. Thank you for the unforgettable night and we hope Stray Kids will come to Indonesia again soon..
¡¡ HERMOSO, MIS CHICOS,, !! FIGTHING,, ! !